Benjamin West was an American artist who went to study in Rome in 1760 and returned to England in 1763, to remain there for the rest of his life. Upon his return, the Archbishop of York commissioned West to paint a story from Roman history, Agrippina returning from Syria with the ashes of her assassinated husband Germanicus. She was considered to be very noble and brave since it was believed that Emperor Tiberius who was Germanicus' uncle and adopted father was responsible for the brilliant General's demise. 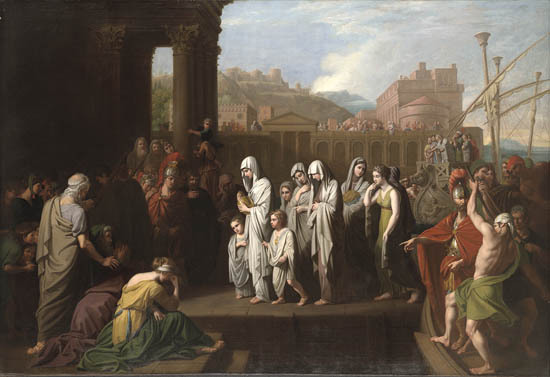 In West's painting we see her as she lands in Brundisium carrying an urn with her two children Caligula and Agrippina junior, all dressed in white (the color of mourning) and is greeted by a large crowd of sympathizers who loved her husband and admired her courage and virtue. She stands composed, not showing her pain on the face of this tragedy which points to the stability of her character. Agrippina Landing at Brundisium with the Ashes of Germanicus, conforms perfectly with the demands of the art scholars of the time who were appealing for a morally edifying art. Agrippina's actions represented exemplum virtutis (example of virtue) meant to inspire paralel virtues in it's viewers. West has highlighted Agrippina and her retinue in the middle of the painting in a freeze-like setting which is reminiscent of the friezes he must have seen in Rome. The ancient Roman city in the back forming a stage-like setting, Agrippina's stoic stance and the dramatic lighting effects are all typical elements of neoclassical painting but some elements of the rococo style are also present. The crying women in the left forefront and the agitated boatmen on the right are worked out with sinuous lines and more vivid colors. Benjamin West was one of the founders and the second president of the Royal academy in London, which was quite a way to go for a man from Pennsylvania, in such a class conscious society. Thanks to him, a lot of other American artists got established in England as students and professionals. According to the Yale University Art Gallery label, this painting would help him become a favorite of the King, George III, who was his life-long patron.